The fifteenth state to enter the United States is Kentucky on June 1, 1792. Kentucky is known as the Bluegrass State. This is due to the large patches of grass growing on lawns, farms, and pastures in which blue-purple buds blooming help add a bluish tint during the spring. Kentucky’s state flag was adopted in 1918, although the design was not finalized until 1928 and changed again in 1962. 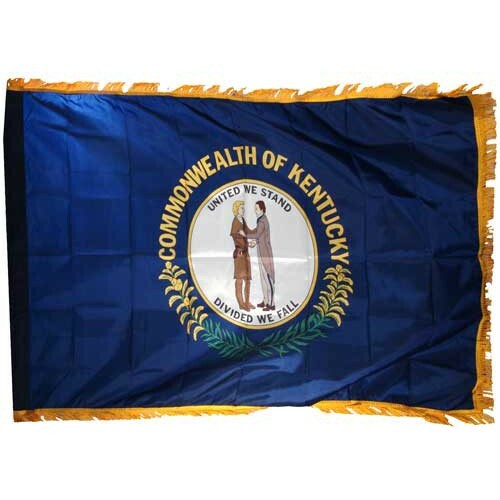 The state’s flag has a navy blue background with the Kentucky state seal emblazoned on the center. Inside the seal, a pioneer and a statesman are shaking hands with the words United We Stand on top and United We Fall below them. Outside the state seal in yellow letters reads Commonwealth of Kentucky and below are two goldenrod flowers. Kentucky is actually the birthplace of Abraham Lincoln, who was the 16th President of the United States from 1861-1865. He was born in Hodgenville, Kentucky on February 12, 1809 in a log cabin. He lived here with his family until 1816 when the Lincolns picked up and moved to Indiana. While one of Kentucky’s most well-known cities is Louisville, the state capital is actually Frankfort. It became the state capitol in 1792 after pledging more manpower of a statehouse than any other city. According to the Kentucky state website (2009), Frankfort’s population is slightly less than 30,000 while Louisville and the Louisville metro area’s population is reported to be 1,556,429. Famous Races: Kentucky is home to the Kentucky Derby which is the oldest annual horse race in the US. It is held at Churchill Downs in Louisville. State Name: The name Kentucky came from the Iroquois word “Ken-tah-hen” which translates to “land of tomorrow”. The first thirteen colonies were co mplete after the admission of Rhode Island into the union. It had been less than one year when the next state, Vermont, became the first state after the formation of the thirteen colonies, also known as state number fourteen. 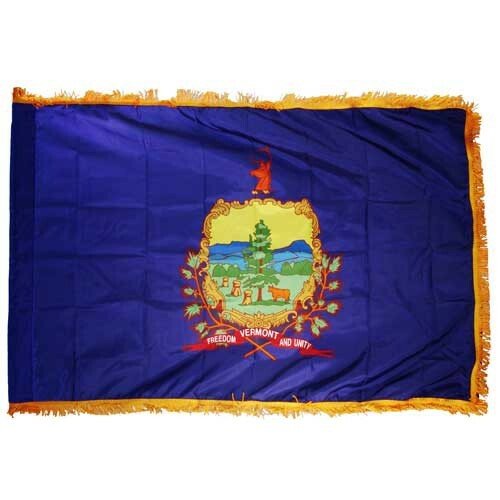 Vermont’s state flag was not adopted until 1923 although there was a previous state flag. This flag is a dark blue with the state’s coat of arms on it. In the coat of arms is a pine tree, a cow, some bales of hay, and sheaths of wheat. There are purple mountains in the background against a blue sk. On top of the coat of arms is a stag’s head, and on the bottom boughs of pine needles envelope the coat of arms. There is also a red ribbon which reads Vermont and the state’s motto Freedom and Unity. Vermont’s name is French for “green mountain”, or mont vert due to the state being surrounded by green mountains. Vermont is also the largest producer of maple syrup in the United States, producing over 500,000 gallons per year. While the state’s capitol is Montpelier, the population in the city is less than 10,000 people. Cool Trivia: Vermont is the state where Ben and Jerry’s Ice Cream was founded! The company also gives their ice cream waste to local farmers who then feed it to their hogs(unfortunately, mint Oreo is not their favorite flavor). Chester A. Arthur (serving 1881-1885) was also born in Fairfield, VT in 1830. Calvin Coolidge (serving 1923-1929) is the ONLY US president to have been born on the 4th of July in Plymouth, VT. The final colony to enter the union is Rhode Island on May 29, 1790. It is the smallest state in the United States at Rhode Island is so small that they’re composed of only five counties! Despite being a small state, Rhode Island is well known for it’s large shoreline. Set on Narragansett Bay (Atlantic Ocean), the shoreline runs for nearly 400 miles, earning the nickname “The Ocean State”. 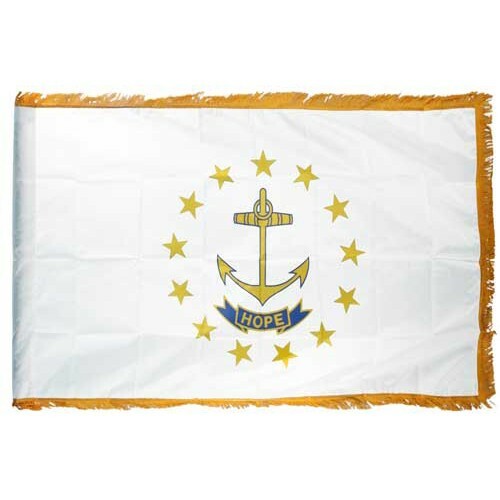 The Rhode Island state flag was adopted in 1879. The flag is white with a yellow anchor in the center. The anchor is encircled by thirteen yellow stars to represent the thirteen colonies. Underneath the anchor is a light blue ribbon which reads the state motto “Hope”. The colors on this state flag date all the way back to colonial times, the original establishment of Rhode Island, and the Providence Plantations ruled under King Charles II of England. Rhode Island is home to two war memorials. The first memorial is The Korean War Memorial of Rhode Island in Providence, RI. The memorial was erected to honor Rhode Island citizens who served and died in the Korean War (1950-1953). The names of those Killed in Action (KIA) or Missing in Action (MIA) are engraved in white bricks while the red bricks bear the names of the men and women who served during the war. The second war memorial is The World War I Memorial in Miantonomi Park, RI where it was established in 1921 to memorialize those who had been lost in WWI (1914-1918). The memorial is 100 foot tower of stone along with a 30 foot flagpole at the top. It became listed as a National Historic Park in 1969. The Ocean: Nearly all residents of Rhode Island live about 30 miles from the ocean! Early Days: Rhode Island was originally known as “The Colony of Rhode Island and the Providence Plantations”, an early settlement. After the American Revolution, the land became known as the State of Rhode Island. Any day is a great day to let your colors soar. However, there are some days that are most notably American flag flyin’ days! Did you know that there are customary rules for displaying the American flag? For instance; The flag should only be flown from sunrise to sunset. When the sun goes down, the flag should too! Unless you have it illuminated, then it’s ok to to have on display 24/7. Also, you should never fly another flag above the American flag. If you must have another flag up, it has to be to the right of the American flag, and on an equal or lower level. Regardless of how many flags you choose to display, the American flag should alway be hung with the stars in the top left corner! Those are just a few of the guidelines for flying the American flag. There are quite a few others. I never knew that there were so many stipulations on American patriotism. Did you?